We are delighted to announce an AWARD nomination for the ‘Smile!’ holiday Workshops. You can also register your interest or sign up for any of our workshops by clicking the button below the picture. Easter 2019 is fully booked. Next available workshop is Summer 2019. *Nominated for ‘ Best Holiday Workshops’ in the 2019 Hoop awards. 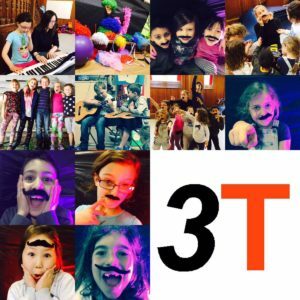 3Theatre is a new approach to theatre education and aims to build confidence through the arts, created by Claire Doyle in 2016. With over 20 years of performance and teaching experience, alongside extensive training at the Royal Academy of Music (London) and the Theatre School of Dance and Drama (Edinburgh) Claire has enjoyed a varied career receiving an array of accolades, including the HL Hammond Prize (RAM). In addition to her wide-ranging performance experience, Claire has enjoyed playing a key creative role in a multitude of innovative theatre, film and dance projects worldwide. Now living in Edinburgh with her young family and regularly leading workshops for youths, Claire has come to appreciate the brilliance and creativity of young minds and the importance of confidence, resilience and positivity in their development.Claire’s wealth of experience and training coupled with her desire to support and encourage young people lead to the creation of 3T – an inclusive social enterprise designed to harness the power of the imagination and spread the joy of creativity … to all! The 3Team is made up of hand picked, experienced professionals in theatre, music, performance and teaching who guide all students through their learning journey. 3T continue to work alongside schools and nurseries and provide bespoke workshops/classes designed to engage and inspire young minds.In every holiday you’ll find a ‘Smile!’ project and you can also catch us running classes for local after school clubs programmes. Claire also takes on private students in the UK and America and is invited to teach visiting ( overseas) and resident performing arts students across Scotland. In 2018 and 2019 we started to fund and part fund creative experiences for primary/secondary schools, local community groups and charities. More information can be found by reading on or by following our creative adventures on social media or selecting the appropriate section from the drop down menu. These award nominated workshop experiences have been rated 5 Stars by participants, parents and industry professionals. Smile recognises a brand new approach to theatre. The aim is simple; create a supportive and creative environment in which everyone can realise their potential. Students are given the practical tools and opportunity to explore ideas, gain confidence in their ability and instincts and be inspired to work effectively towards their goals. 3Theatre prides itself on inclusivity and students of all ages, stages and confidence levels are welcomed with a smile. We offer two award programmes. All ‘Smile!’ participants have the opportunity to record their journey from the workshop to be submitted for an accredited award. By recognising each student’s learning journey, the aim of the award programme is to highlight personal achievement and how these skills can transfer into life and work.These awards are recognised by SQA and SCQF ( the national credit transfer system for all levels of qualifications in Scotland). Each Saltire award/young volunteer student can also be put forward for recognition of their work and time. 3Theatre believe that the benefits of the arts should be available to everyone, regardless of circumstance. If you are part of a school, community group, private company or charity and have an idea to create something special, please get in touch using the contact form on this site. We love brainstorming unique and inspirational ideas. To find out more about our work you can check out our Insta, Facebook, Twitter and facebook for updates and sneek peeks! Have a scroll down to read sample testimonials or contact us directly through this site. We are learning every day from experienced people. I developed confidence, social and communication skills. Thank you 3Theatre! Working with you was a creative, magical joy. Thank you SO much to Claire Doyle and 3Theatre for the fantastic week our three children had at the Smile workshop. Thank you for understanding and letting them be who they really are! So impressive and the best thing my daughter has ever done. Both my children Choose ‘ Smile!’ because Claire allows them to use their imagination to create a story,tell it in their own words and perform in a way they feel comfortable with.The pride and confidence they gain from this is immeasurable, thank you to 3Theatre for another wonderful experience! I did it! I can do it again.I want to do more. Claire is one of the best teachers I’ve ever been lucky enough to work with. Incredibly talented as a performer herself and with all of her teaching experience she’s simply the perfect tutor to bring out the best in anyone who wants to succeed creatively, in any of the performance disciplines. Smile was an enjoyable and well run theatre project, ending in a well staged and enthusiastic performance that was fun to watch. All the children seemed very happy to be on stage and they had clearly gained a lot of confidence to to work as a group. Thank you! Thank you so much for making this morning’s event such a fantastic success. The event went perfectly and the feedback was excellent. Your involvement in this morning’s event was much appreciated…. Thanks to you , the children, audience and VIPs had a wonderful time. On behalf of everyone at E Linton can I thank you for the fantastic job you did with the (students). …they loved it and had a real ‘moment to remember’ yesterday. Your enthusiasm was inspirational. Many congratulations. Lots of positive feedback from our parents too. Thanks . My youngsters enjoyed it SO much and it meant a lot to them all. For some of them in particular …. it will have boosted their self-esteem hugely. For me, seeing their faces today on the stage was just great, and to watch you working with them as been a privilege. Thank you Claire! You were brilliant… hopefully there will be further opportunities for more things like this. The Olympic Torch Relay was really fun, and I would love to do it again but I obviously can’t! I signed up for it because I wanted to get better at performing. Claire was an amazing coach and the workshops were sooooooo much fun! The practice sessions were fun as Claire, who taught us everything, was really upbeat, enthusiastic and energetic… I’ll remember it forever. …the performance on Friday… was one of the best events I’ve ever been to.